It’s Moonlight‘s time to shine. 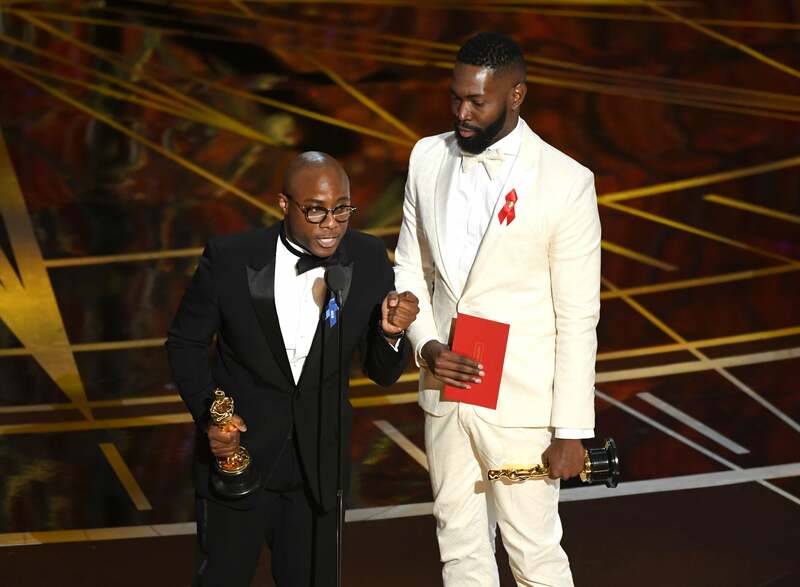 Director Barry Jenkins and original playwright Tarell Alvin McCraney co-penned the critically acclaimed film and took home the prize for Best Adapted Screenplay at Sunday’s 89th annual Academy Awards in Los Angeles. The film is an adaptation of McCraney’s play, In Moonlight Black Boys Look Blue, which tells the three-part story of Chiron, a gay black man who grows up in Florida and attempts to come to terms with his masculine, racial, and sexual identity. Moonlight is up for a total of eight awards including a best director nod for director Jenkins, and best supporting actor and actress nominations for Mahershala Ali (Luke Cage) and Naomie Harris (Skyfall), respectively. The film is also nominated for best picture. Moonlight beat out Hidden Figures, Fences, Lion, and Arrival for the prize. The 89th Annual Academy Awards, hosted by Jimmy Kimmel, are airing live from Los Angeles on ABC.